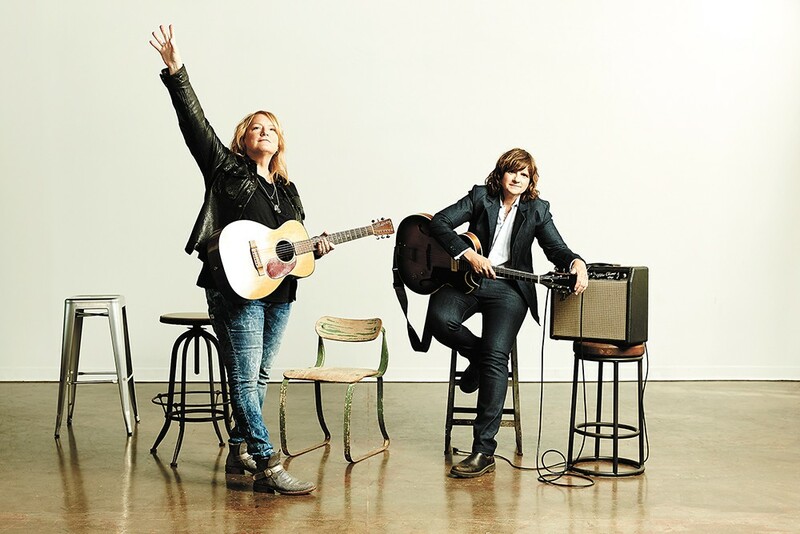 Indigo Girls' Emily Saliers (left) and Amy Ray are still challenging themselves musically. Given that Indigo Girls' Emily Saliers and Amy Ray have performed together for more than 35 years in venues as small as a living room and as large as a football stadium, it's hard to think that much could throw them off their game. The first time they took the stage with a symphony, though, a few years ago to perform orchestral versions of their songs, there were serious nerves. "Amy would tell you that she almost threw up. It was a big deal for us. We were excited and we wanted to do a good job," Saliers says via phone from Atlanta. Now, having performed collaborative shows with both small community orchestras and big-city symphonies, the duo has their "sea legs" when it comes to playing the string- and horn-laden versions of favorites like "Galileo" and "Least Complicated." Even so, Saliers says, "it's never a thing that you can just glide through, because each town and each symphony and each hall is so different." Saliers and Ray jumped at the chance at having their songs orchestrated by arrangers Sean O'Loughlin and Stephen Barber, having heard their work with the likes of the Decemberists, John Legend and Rosanne Cash. But having charts and putting on a great show are two different things, and the gigs are challenging for the touring veterans. At each stop, Saliers says, "we meet with the conductor for 30 minutes and go through spots to look out for, we have one two-and-a-half hour rehearsal, and then it's showtime." Their comfortable headlining gigs and the bond between the two — Ray of the more raucous voice, Saliers of the more beautiful — helps them weather moments when things get "off" with the orchestra on stage. More often, though, there will be a "perfect storm" when the conductor, symphony and duo pull it all together and "we'll feel integral to the arrangement, and we won't really have to think about anything." Some songs, like Ray's rocking "Go" and "Compromise," are dramatically reimagined in the symphony shows, Saliers says: "There's no drums, there's no bass, it's just symphony and me and Amy." Other arrangements that fans might expect to work well with an orchestra, like Saliers' "Ghost," take already emotional songs to a whole new level. "It's just stellar," Saliers says of the haunting concert staple. "I almost don't want to be playing it. I want to be listening to it because the arrangement is so beautiful."